BAGHDAD (AP) — Iraqi officials say a series of explosions mainly targeting Shiite worshippers have killed at least 58 people. The violence appeared to be an attempt by insurgents to demonstrate they are still a potent force days after Iraqi authorities announced the killings of the top two al-Qaida in Iraq leaders in what was seen as a major blow. The biggest of Friday's bombings targeted the offices of an anti-U.S. Shiite cleric in the vast slum of Sadr City in Baghdad. Police and hospital officials said at least 25 people were killed and more than 100 wounded there. At least 33 people were killed in other explosions, including in western Iraq. BAGHDAD (AP) — A triple bombing hit the main Baghdad office of an anti-U.S. Shiite cleric in the deadliest of a series of attacks across Iraq that killed 44 people and wounded more than 200, officials said. The violence came days after Iraqi authorities announced the killings of the top two al-Qaida in Iraq leaders in what was seen as a major blow to the insurgency. Hospital and police officials say 25 people were killed in the attack on Muqtada al-Sadr's office compound as worshippers were leaving a mosque after Friday prayers. An estimated 150 people were wounded. The officials spoke on condition of anonymity because they were not authorized to speak to the media. Bombings elsewhere in Iraq — most of them targeting Shiite worshippers — killed 19 other people in one of the deadliest days the country has seen in weeks. 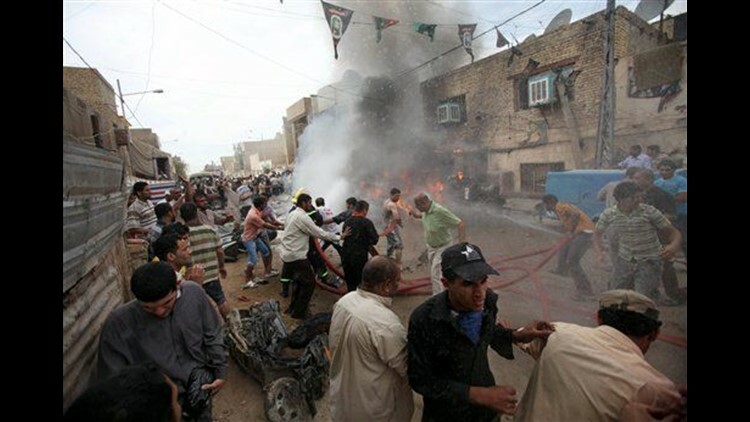 Targeting Shiite mosques is a hallmark of the Sunni-dominated terrorist group al-Qaida in Iraq. Explosions outside three Shiite mosques in Baghdad, all timed around the end of Friday's prayers, appeared to be the work of insurgents looking to inflame sectarian tensions. Iraqi Sunnis also were targeted: A ring of bombs planted around the homes of policemen in the western town of Khalidiya killed seven in a pre-dawn attack, including an Iraqi soldier and a woman. It was one of the most deadly days in Iraq in weeks, underscoring the state of its anemic security. In the slums of Baghdad's Sadr City, two parked car bombs and a roadside bomb exploded around 1:30 p.m. near the office of al-Sadr. His followers, hard-line religious Shiites, use the building for Friday prayers, the main worship service of the week. Two police officials and medics at the nearby Sadr and Imam Ali hospitals gave the casualty figures. All four officials spoke on condition of anonymity because they were not authorized to talk to the media. A spokesman for the Baghdad operations command, Maj. Gen. Qassim al-Moussawi, put the number of dead in Sadr City at 10, and added that another bombing at a marketplace in the northern Rahmania area of the city killed two people and wounded seven. It is common for the casualty count to vary in the immediate aftermath of attacks.